These fabulous duo`s are the newest edition to the Evolve family. The mixture of boosting collagen, combined with the smooth texture of the products will leave the skin feeling firmer and more youthful looking. 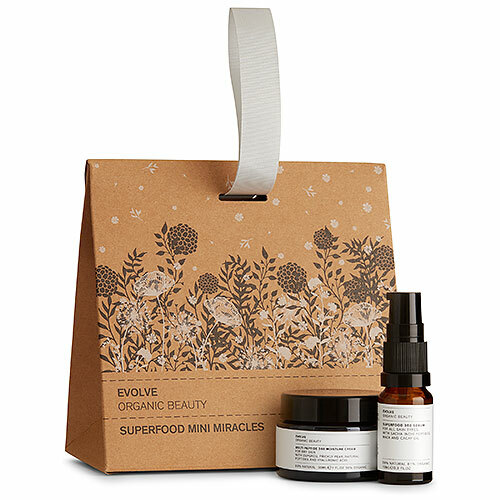 The Superfood Mini Miracles set contains Evolve Beauty`s Multi Peptide 360 Moisture Cream and Superfood 360 Serum. Superfood 360 Serum: Aqua (water), rosa damascena flower water*, citrus aurantium amara flower water*, glycerin*, hydrolyzed plukenetia volubilis seed extract, caryodendron orinocense seed oil, aloe barbadensis leaf juice powder*, sodium hyaluronate, hydrolyzed lepidium meyenii root, sodium levulinate, lysolecithin, sclerotium gum, sodium dehydroacetate, xanthan gum, isoamyl laurate, pullulan, sodium anisate, maltodextrin, isoamyl cocoate, silica, sodium benzoate. Multi Peptide 360 Moisture Cream: Aqua (water), caprylic / capric triglyceride*, isoamyl laurate, glycerin*, cetearyl alcohol, glyceryl stearate, candelilla/jojoba/rice bran polyglyceryl-3 esters, theobroma grandiflorum seed butter*, helianthus annuus (sunflower) seed oil*, caryodendron orinocense seed oil,hydrolyzed plukenetia volubilis seed extract, opuntia ficus-indica stem extract, sodium hyaluronate, aloe barbadensis leaf juice powder*, dipalmitoyl hydroxyproline, sodium stearoyl lactylate, isoamyl cocoate, microcrystalline cellulose, sodium levulinate, vanilla planifolia extract*, rosa damascena flower oil*, citrus reticulata peel oil*, sodium dehydroacetate, cetearyl glucoside, xanthan gum, cellulose gum, sodium anisate, tocopherol, disodium phosphate, sodium benzoate, d-limonene. Below are reviews of Evolve Superfood Mini Miracles Gift Set by bodykind customers. If you have tried this product we'd love to hear what you think so please leave a review.